Stage IIIB bladder cancer; drawing shows cancer in the bladder and in (a) more than one lymph node not near the common iliac artery and (b) one lymph node near the common iliac artery. Also shown are the right and left common iliac arteries. 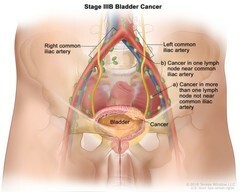 Stage IIIB bladder cancer. Cancer has spread from the bladder to (a) more than one lymph node in the pelvis that is not near the common iliac arteries; or (b) at least one lymph node that is near the common iliac arteries.